Cheesecake is one of those desserts that can have a few pitfalls, the most common of which is that it cracks while baking. As it turns out, though, there are several missteps that can lead to cracking. The following tips will help keep you on track so your cheesecakes turn out just fine. Note that they don't necessarily appear in order of importance, but rather in order of the actual steps of baking the cheesecake. Ingredients: To begin with, don't use cream cheese that comes in one of those plastic tubs. Only use solid, rectangular blocks of cream cheese. The stuff in tubs has air whipped into it and it won't work out the same way. Also, full-fat cream cheese (and sour cream) works best. Room Temperature: Make sure all ingredients — the cream cheese, sour cream, eggs, and even the sugar — are at room temperature. This will allow the ingredients to blend together better, giving you a smoother cheesecake. If the cream cheese is too cold, it can ultimately lead to a lumpy cheesecake. Don't Overbeat: And you want to mix thoroughly, but not too thoroughly. Overbeating can cause the cheesecake to crack when you bake it. When you're combining the sugar, cream cheese, eggs, and other ingredients, do it on a medium-low speed. The paddle attachment (as opposed to the whip attachment) of a stand mixer is best so that you don't beat too much air into the batter. Use a Springform Pan: The best pan for baking a cheesecake is a springform pan. These pans have removable sides, so you can release your cake without having to flip the whole pan over — and why tempt fate that way? Make sure the bottom is greased when you press the graham cracker crumbs into the bottom, and make sure the sides of the pan are well-greased when you pour in the batter. Melted butter is great for greasing the pan, but you can just rub it with butter or even spray it with cooking spray. They make springform pans with a nonstick coating but grease it anyway. Keep it Moist: A dry cheesecake will also crack. To prevent this, we bake a cheesecake with a pan of water in the oven. This will generate steam, and a steam oven will prevent the cheesecake from drying out. This is similar to the way we bake a creme brulee in a water bath — both creme brulee and cheesecake are essentially baked custards. You can do this with a cheesecake, too, but you have to wrap the springform pan with foil to make sure it doesn't leak. This, too, is just asking for trouble. Put the roasting pan of water on the lower rack and bake the cheesecake on the upper rack. No Peeking: Don't open the oven while baking! You don't want to let all that steamy air out. 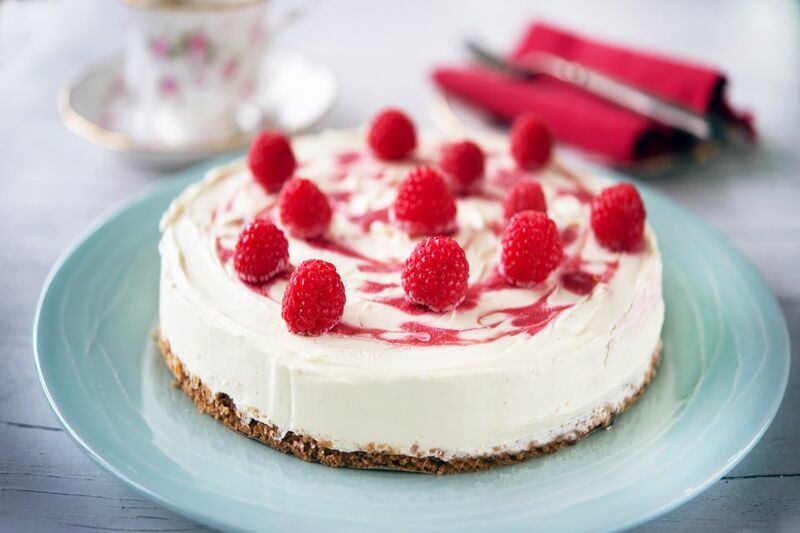 Changes in temperature during baking can cause the cheesecake to crack or sink in the middle. No Poking: Don't poke anything into the center of cheesecake to see if it's done. All you'll do is make a hole in it. That goes for instant-read thermometers. It so happens that when the center of a cheesecake hits 150 F, it's done. But the only way to know that is to poke it with a thermometer. Don't do it. Instead, just give it a jiggle. If it's firm at the edges and still wobbles a little in the center, it's done. Damage Control: If something does go wrong, your cheesecake will probably still taste great. If it comes out cracked, you can always cover the cracks with fruit or even a simple sour cream frosting. If it's lumpy, promise yourself you'll let your ingredients come to room temperature next time. If you can't get it out of the pan, break out the forks and dig right in.